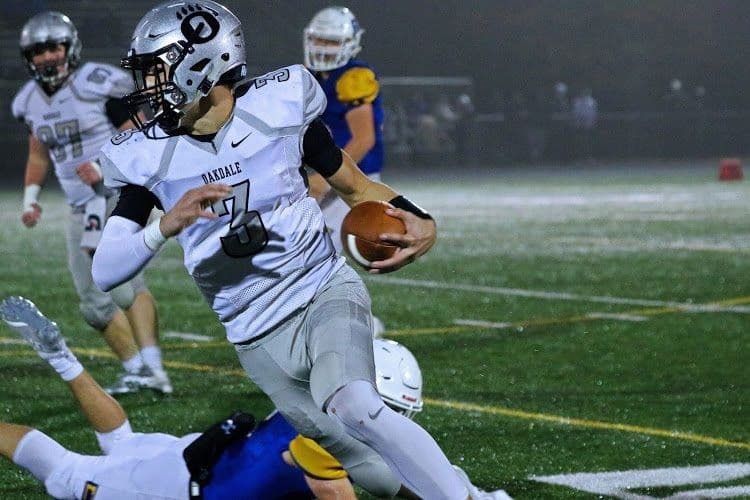 Throwing for two touchdowns and running for two more, Oakdale quarterback Collin Schlee led the Bears to a 35-7 win over previously undefeated Glenelg for their first Maryland State Championship. The DC Touchdown Club and WTOP are partnering all high school football season-long to honor a Player of the Week and help choose a DMV Game of the Week. Read about this week’s Player of the Week, and vote in the poll at the bottom of the article for the DMV Game of the Week. WASHINGTON — It would take a few years until Collin Schlee became the Oakdale High starting quarterback, but head coach Kurt Stein knew he had a special player. Schlee’s older brother, Cory, was the Bears starting quarterback, so Collin – with his strong arm – was always around. While Schlee also excelled at baseball and basketball, he decided his future was in football. He has accepted a scholarship offer to play for Kent State. That’s the next step. But for now, Schlee and his teammates are celebrating their final accomplishment on the high school football field. Schlee passed for 210 yards and two touchdowns and rushed for 89 yards and two more scores, leading Oakdale to a 35-7 win over Glenelg in the Maryland 2A championship game, completing a 13-0 season that included three postseason wins over previously undefeated teams. For his efforts, Schlee was named the Military Bowl DC Touchdown Club High School Football Player of the Week. Friendship Collegiate DB Amirr Abdul-Rahim returned an interception for a touchdown as the Knights shut out H.D. Woodson, 13-0, in the DC State Athletic Association Class AA championship game. Glenelg RB Wande Owens rushed for 103 yards and a touchdown, but the previously undefeated Gladiators lost to Oakdale, 35-7, in the Maryland 2A title game. Stone Bridge RB Nick Mell rushed 34 times for 224 yards and five touchdowns as the Bulldogs beat North Stafford, 49-26, in a Virginia 5A semifinal. Quince Orchard RB Marquez Cooper rushed 39 times for 256 yards and three touchdowns as the Cougars beat North Point, 40-33, in the Maryland 4A championship game. Westfield WR-DB Taylor Morin filled in at quarterback after a teammate’s injury and had two long touchdown runs, a touchdown pass and a fumble return for a touchdown in the Bulldogs’ 35-28 loss to Freedom-Woodbridge in a Virginia 6A semifinal. Douglass LB Tyree Newman made a game-high 13 tackles in the Eagles’ 20-8 loss to Fort Hill in the Maryland 1A championship game. Freedom-Woodbridge QB Quest Powell threw three touchdown passes as the Eagles beat Westfield, 35-28, in a Virginia 6A semifinal, ending the Bulldogs’ 37-game winning streak. North Point QB Asa Williams completed 19 of 29 passes for 349 yards and four touchdowns and ran for another score in the Eagles’ 40-33 loss to Quince Orchard in the Maryland 4A championship game.